That Wraps Up #CIVLUFVBattle 2015! Brennan Sinclair, Pest Synapse, Alex Rake, and Western Jaguar went head to head for the final on March 27th! All the artists did great, bringing their best to rock U-House down to its foundation! Western Jaguar won first place and took home the big prizes but everyone else got something too. The top three winners all got prize recording packages from SleepingBagStudios as well as the opportunity to play at their very own Envision Financial Concert in the Park night, courtesy of the Abbotsford Arts Council. Alex Rake will be playing on stage at the Abbotsford Arts Council’s 11th annual Arty Awards! Western Jaguar also won a photography package from Jayme Anne Photography! We thank you all for supporting our events and would like to thank The Eurythmic Kings of Nowhere, Beau O’Neil, and Bob and Al LIVE for competing! Check us out next year for our 4th annual #CIVLUFVBattle! Are you guys excited yet!!? Pest Synapse, Bob and Al LIVE, Beau O’Neil, and Brennan Sinclair are going to be taking to the stage tonight for the kick-off of our #CIVLUFVBattle! Doors open at 5 and bands start at 5:30! Next week will have even more bands and then the finalists’ battle is on March 27th so put those dates in your calendar and come check us out for three weeks straight! Our first battle is just a week away and we are extending the application deadline! Even if you think your songs need some work, you’re a jam band, or an “experimental project”, sign up and you might just encounter similar artists that can help you develop your sound! Check out our old post for more details! We are also looking for judges so if you have some experience in the music industry or know anyone else who may be interested, apply now and get involved with the Fraser Valley music scene. Amplify your community! 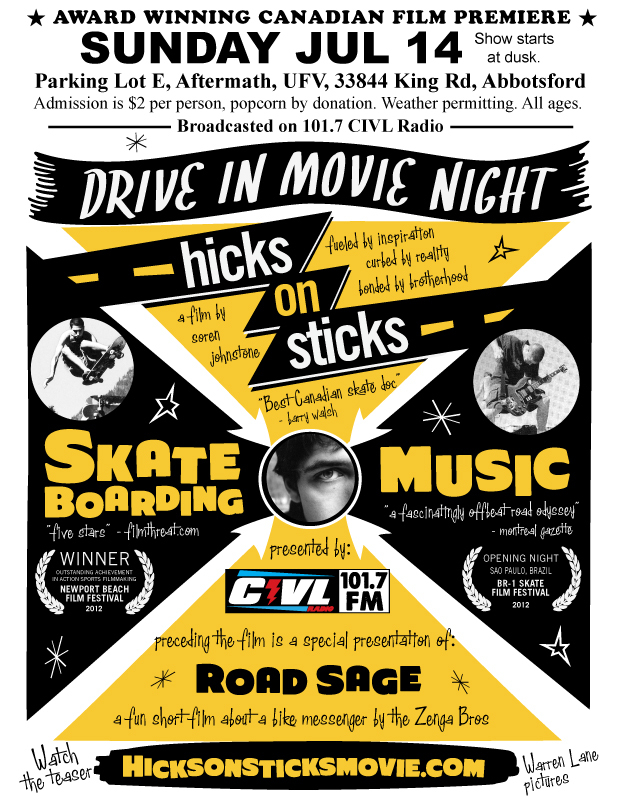 Sponsorship opportunities available, contact battle@civl.ca for more details! CIVL 101.7 FM is hosting their 3rd annual #CIVLUFVBattle! The contest is open to any band or artist that have a member that is/was a UFV student! Prizes include studio time, professional photography and chances to play at the Arty Awards and Envision Concert series in the Park. Our first ever #CIVLBattle was a great success with our first place band winners, Derrival going on to compete at with the Peak Performance Project and become finalists! Concert dates are Fridays, March 6-20 with the final showdown happening on March 27th! Doors open at 5 PM with music starting at 5:30 PM. We’re hosting the event at U-House at the Abbotsford UFV Campus. Registration closes March 1 Extended, register soon!. Stay tuned as this posts will be updated with more details! CIVL is Heating Up with AHL Hockey! CIVL is pleased to announce that AHL Hockey will be broadcast live on 101.7 FM all year for the 2013-2014 season with 76 regular season Abbotsford Heat home and away games! Stay tuned for all the details, and find out about what else is in store for the coming year with CIVL 101.7 FM!